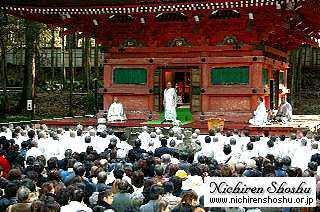 On February 16, in the early morning hours after dawn, the Otanjo-e Ceremony was held first in the Mieido of the Head Temple. Then the High Priest Nikken Shonin, followed by a procession of priests and lay believers, made their way climbing up the path to the Five-Storied Pagoda. The doors of the Five-Storied Pagoda are opened once a year only on this particular day, and the High Priest solemnly prays to the Gohonzon enshrined inside the pagoda. This ceremony is held each year to celebrate the birthday of Nichiren Daishonin, the advent of the True Buddha of the Latter Day of the Law. After the ceremony, each attendant was treated to omiki (sake), dried beans, and candies. The Five-Storied Pagoda of the Head Temple is designated as an important national cultural property. 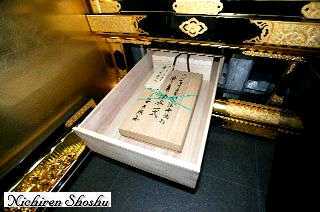 On February 7, the memorial day of Nikko Shonin (Koshi-e), memorial materials of the 750th anniversary of Nichiren Shoshu, including list of offering 430,000 believers during 1999-2002 for the Hoando construction, ceremonial address of Nikken Shonin at the opening ceremony, the memorial robe of His Holiness worn then and recent publications in Japanese and many other languages, were stored in a drawer under the Great Original Gohonzon.